Joyce Yamada (American, b. 1949) is a Brooklyn-based artist working in both painting and multi-media installation. 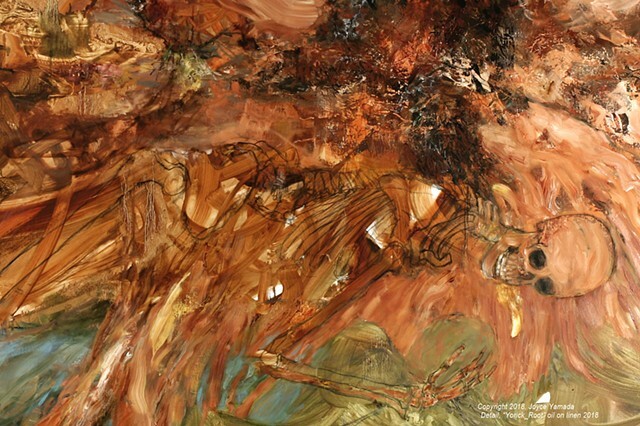 An intuitive painter using complex imagery, she is profoundly interested in science, ecology, and the environment. She probes the relationship between humans and nature, the deep history of life on earth, and our possible futures. Technical note: Click image to enlarge. You can scroll through each section at this scale. To return to Portfolio, click anywhere outside the image.